Scooper - Technology News: Which are the world’s most visited cities? 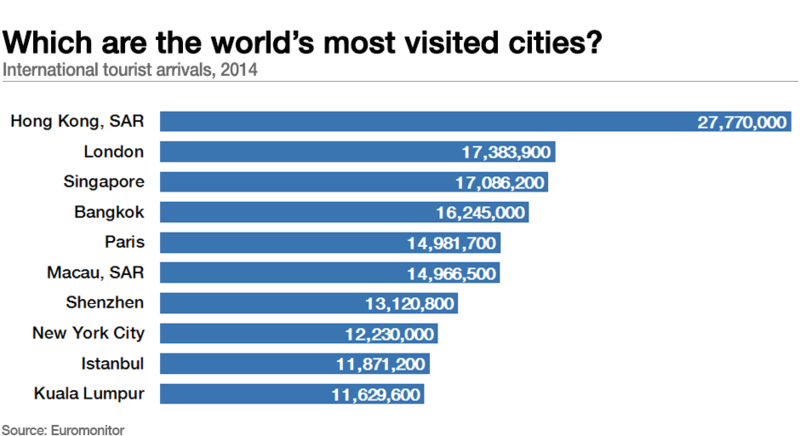 Which are the world’s most visited cities? For the sixth year in a row, Hong Kong is the most visited city in the world attracting nearly 28 million visitors in 2014, according to Euromonitor International . London was a distant second with 17 million visitors -- 10 million fewer than the leader. Hong Kong cemented its place at the top with an increase in visitors of over 8% from 2013 to 2014. This equated to over 2 million more visitors in 2014. The strength of Hong Kong is its position as a major gateway to the Chinese mainland, as well as its popularity among multinational firms. London surged past Singapore and Bangkok to take second place. Growth of over 3% saw London’s visitors hit nearly 17.4 million in 2014. London’s iconic status and the success of the 2012 Olympics are major factors behind its high visitor numbers. However, the city’s major airports are reaching capacity and the report argues it could start to lose out to European competitors. “To remain competitive in the international city destinations landscape, ensuring connectivity and innovation is key,” Wouter Geerts from Euromonitor said. Singapore keeps its place in 3rd, despite a slight decline in visitor numbers. The report attributes this to falling visitors from key markets, such as China and Indonesia. However, with strong government focus on tourism and the expansion of Singapore Airlines, opportunities and strengths remain. What are Europe's top tourist destinations? Which country’s tourists spend the most money?